Follow the latest campaign updates here. Pledge to sit with the TAA on April 5th: Sign the pledge! Hundreds of graduate workers have taken action to improve our working and living conditions by pledging to join our Sit in at Bascom Hall on Friday, April 5, from 10:00am–1:00pm. Other universities are doing better. 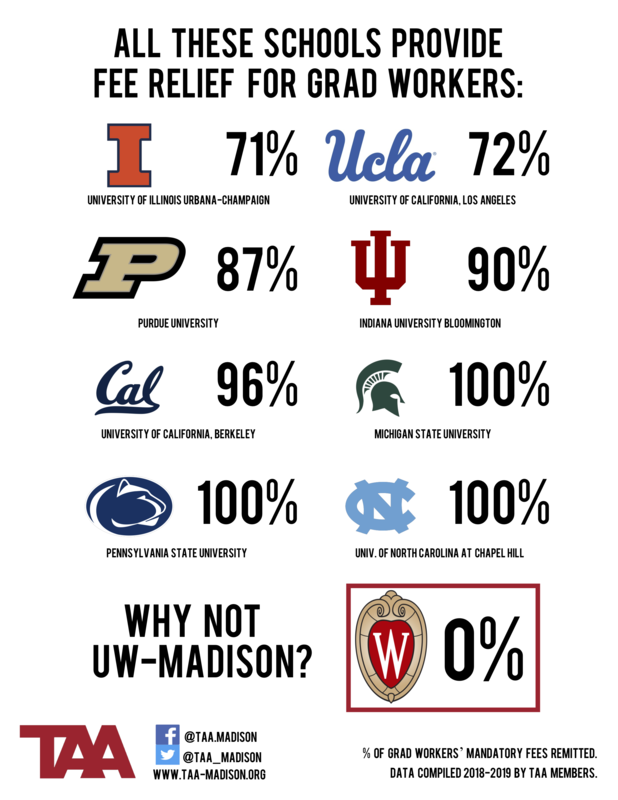 Peer institutions like Michigan State and UC–Berkeley have higher pay for graduate workers and cover more than 95% of fees for those workers. The international student fee is new and discriminatory. Our administrators implemented this fee four years ago when they were facing more budget cuts from Governor Walker. The City of Madison passed a resolution in 2003 calling this fee discriminatory. Chancellor Wiley called on the university to cover this fee that same year. We need to push our administrators to keep their promise to international students. We need clear, consistent, and quality policies. Graduate employees have been working without an enforceable contract, policies or procedures since 2011. Though university administration says they are following our 2009 contract in the interim, we know this is not the case. Graduate employees who feel overworked or unsafe in their workplace have little recourse to resolve that issue. The TAA has been working with administrators in good faith for over 3 years to get renewed policies and procedures in place, and they have yet to be signed into practice. The final proposals for this handbook have been sitting on the desks of our administrators for more than a year. Dean Karpus needs to sign the document to protect graduate workers with quality policies. Organizing gets the goods. Grad workers at UNC Chapel Hill won fee relief earlier this month after showing the admin they had the strength to withhold grades. Grad workers at Northwestern forced their administration to end international student fees on the eve of a large demonstration. Grad workers at University of Illinois at Urbana-Champaign won better policies last year by forcing administration to the table with a strike. Over the last two years, teachers across the country—Los Angeles, Arizona, Colorado, West Virginia—have won better working conditions through collective action. We will too.